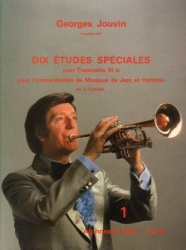 10 Special Etudes for B-flat Trumpet for the interpretation of jazz and popular music. In two books. Includes piano reduction of the orchestral accompaniment.